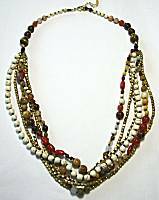 We have a nice selection in our store of gemstone beaded necklaces, in a variety of styles that are influenced by the shape, color, and texture of the stones. 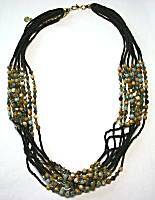 This page offers necklaces only in this category, with coordinating earrings if available. 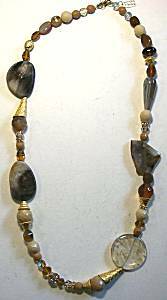 About 18 inches long, the feature of this necklace is the 1-3/8 inches long pendant. Twigs were likely the model here, with pure silver electroformed around them. Set into it are AMETHYST, BLUE TOPAZ, PERIDOT and MOONSTONE. There is also a clear QUARTZ point cuffed to one side (it has an irregular rough top). 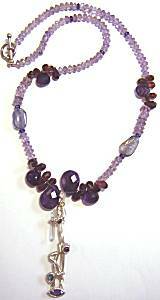 The beading features deep purple AMETHYST brioletes and smaller GARNET faceted teardrops, plus IOLITE nugget beads and faceted rondelles of lighter amethyst. Sterling toggle clasp. 22 inches long, this is a bold and substantial necklace, highlighted with goldplated findings to lend a dressier and elegant look. Lobster clasp in back, beaded on wire. The large gemstones we can only guess at what they are, as they are extraordinarily unique! The largest flat round is 1-1/2 inches across, looks like amethyst or a dyed spider quartz. 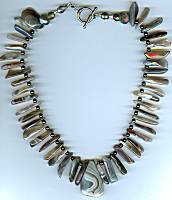 There are gray translucent agates, sunset colored agates, crystals in pale lavender and blue. Purple colors include violet into plum and inbetween!